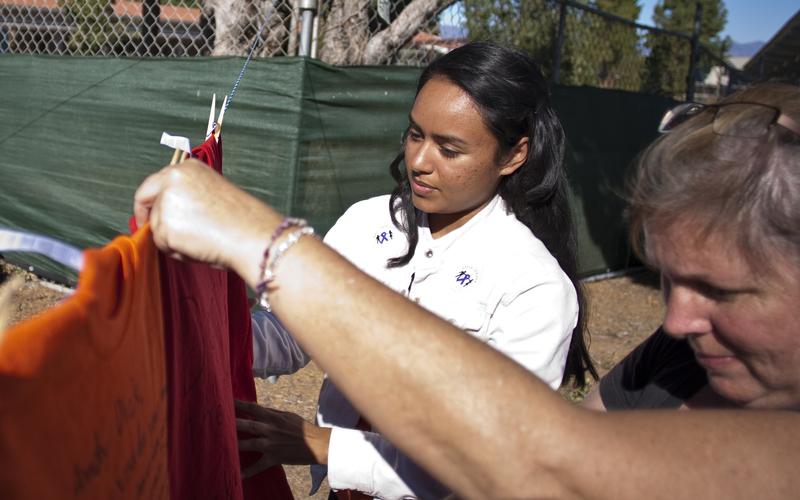 Holly Hagan (front) and Monica Jimenez (rear) hang T-shirts with freshly-written messages on the line during Pierce College’s Clothesline Project for Domestic Violence Awareness event to on Oct. 24, 2012 in Woodland Hills, Calif. 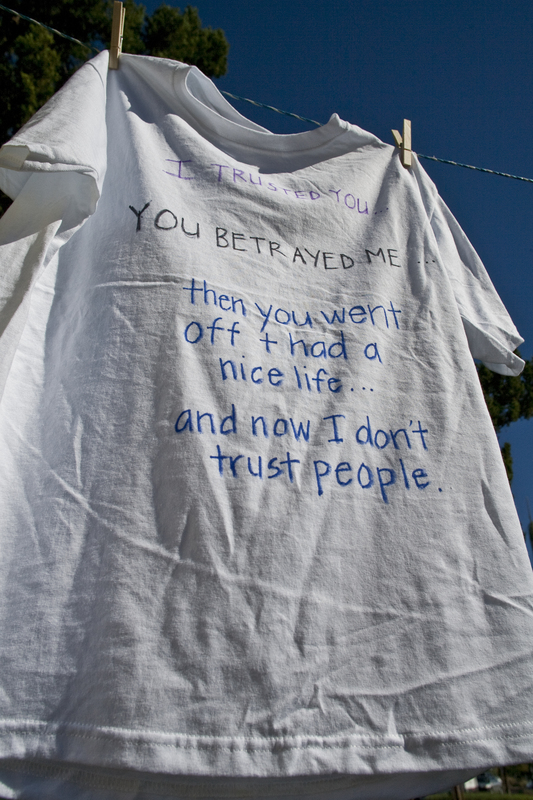 The shirts, each written by Pierce students, faculty and staff, hung along the Mall near the Student Store as testament to the far reaching effects of domestic violence. Strings of T-shirts dressed the Mall in flapping blues, purples, oranges, reds, greens and whites as they caught the wind and painted the southwest end with scrawled messages of pain, anger and hope. With his back to the clotheslines, Nick Schafer sat straight and still with one hand, half-covered in a white sleeve, touching the curve of his forehead. Running it to the back of his neck or the top of his mouth, only his hand moved for minutes at a time as he stared at a blank, orange shirt. 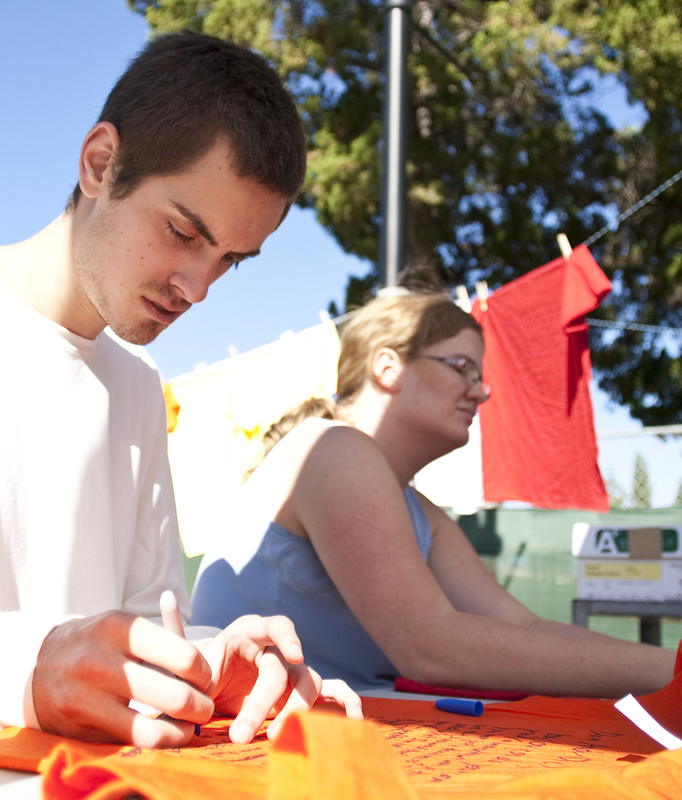 Schafer painstakingly constructed a letter to a man, his sexual abuser, for the Clothesline Project, a nationwide domestic abuse awareness campaign hosted at Pierce College on Wednesday. Behind him, each color signified a different story, a different kind of abuse. Pierce students Nick Schafer and Brandi McMullen pen their own message on a white T-shirt during Pierce College’s Clothesline for Domestic Violence event to on Oct. 24. Schafer spent fifteen minutes scribing his account of abuse at the hands of a celebrity, while McMullen penned a message of resistance and hope for victims. Over the past four years, Holly Hagan, bookstore buyer for Pierce College and a survivor of domestic abuse, collected about 250 shirts from Pierce men and women affected by domestic abuse, and about half of them flicked and twisted in the wind from 9 a.m. to 3:30 p.m. The Clothesline Project was created in Cape Cod, Mass., by a coalition of women’s groups to educate the passer-by, break the silence and bear witness to violence against women. Throughout the heat of the day, students walked along the clotheslines in contemplation, expressing support and often stopping to write a message on their own shirts. “When you hear the word domestic violence, you don’t think maybe the person next to you went through it,” Melanie Centino, a health education intern at the Pierce College Student Health Center, said. She pointed to an orange shirt written by a woman who was nearly killed by her boyfriend. “It hits you when you hear that story,” Centino said. Occasionally, survivors of abuse express their stories for the first time on the pressed, solid-color shirts, Hagan said. Students battle painful memories while writing, struggling to give voice to their experiences and continue on the path toward healing. Halfway through his letter, Schafer filled the fabric with small, cramped script. His brow slightly creased, he pushed through a mental reel of his abuse to uncover words he’d saved for this man. One woman, who wished to remain nameless for her own personal security, found the strength to write her message with others in mind. She has participated in the Clothesline Project every year at Pierce since 2007. Though she successfully left her abuser six years ago, she still struggles to forget the way he made her feel. “It seems like no matter how much school you get, how many classes you take, you still always feel unworthy. You can’t shake it. It’s always a fight to squash those feelings,” the woman said. 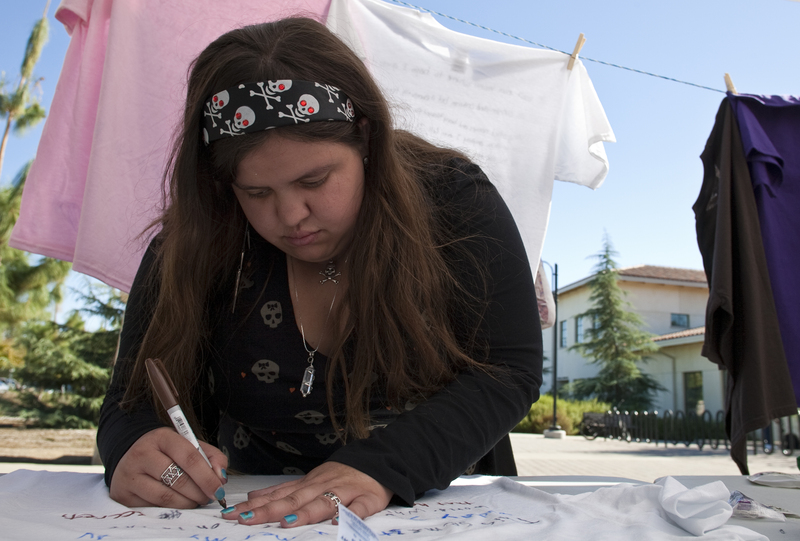 Pierce student Shaina Barnett, 21, pens her own message on a white T-shirt during Pierce College’s Clothesline Project for Domestic Violence Awareness event. The shirts, each written by Pierce students, faculty and staff, hung along the Mall near the Student Store as testament to the far reaching effects of domestic violence.